Falling Through April have an intrinsic ability to craft melody, showcasing that particular element of their sonic arsenal literally one minute into their latest album Zodiac, the very same saccharine infectiousness not heard since Paramore “All We Know Is Falling,” thanks in large part to frontwoman Mikaela Salazar’s capability of taking flight at a moment’s notice. Opener “The Culprit” is an instant classic brimming with massive hooks that are hard to shake, lead single “Desperate Measures” is a powerful representation of Zodiac that clocks in just under three minutes – a churning duel guitar attack from Dan Candia and Jim Siani, Salazar’s perfect harmonies and unavoidably catchy moments, “Seven Tries” is a hopeful and upbeat earworm that sees Salazar perfectly channel Hayley Williams, “Better Off Alone” and “Nothing Changes” punch things up with beefy riffs and potent choruses, “With You In Mind” and “Coast To Coast” slows things down for those fans of mid-tempo ballads and “Fate & Fiction” features explosive hooks and quite the vocal range from Salazar. Zodiac runs one track too long however (not counting the acoustic version of “Better Off Alone”) as “Heart Sails” is the one track that’s not like the other; an alt-rock banger that sounds out of place in the grand scheme of things. Still, it’s hard to fault Zodiac for one blip on the radar for a record otherwise devoid of any blips. Salazar is a shining star on the rise and Zodiac is the rocket strapped to her, and the rest of the bands, back. 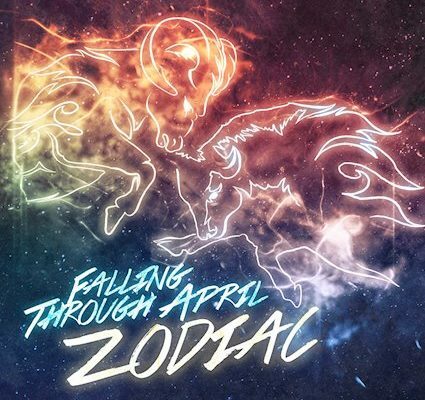 If Falling Through April follows along on this upward trajectory, they are a band that seems destined to ascend to the throne vacated by Paramore years ago.